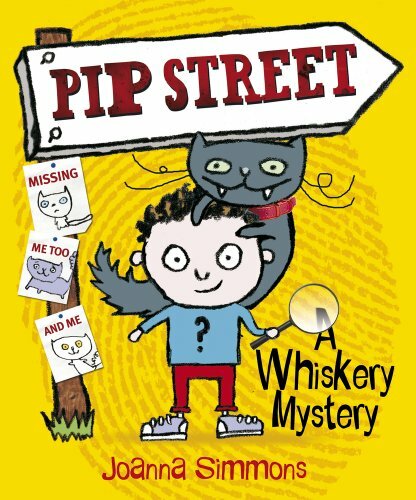 When Bobby moves to Pip Street, it seems at first to be an ordinary street. However, it doesn’t take Bobby long to discover that things keep disappearing, mostly cats, including his own. With the help of Imelda, his small and comical next door neighbour, who has a ‘look in her eyes as fierce as lemons’ and a fondness for dressing up, he sets out to solve the mystery, quizzing the peculiar collection of neighbours: Jeff the Chalk, the Rhubarb family and Mother Pie to name but a few. Of course after careful investigation and a bit of good luck they unravel the mystery and the missing cats are rescued. A humorous story, this is Jo Simmons’ debut children’s book, with the next one already planned for release later in the year. A small chunky format will appeal to young readers, and the black and white illustrations on every page add humour to the proceedings. As an added bonus the reader will find activities in the back of the book such as a quiz and wordsearch. An entertaining and easy to digest book, although perhaps a little too much toilet humour for some readers’ tastes.